According to a recent rumor, the next-generation "iPhone SE 2" may feature a glass back just like the iPhone 8 and iPhone X, suggesting it will feature wireless charging. After debuting an inductive charging solution with the Apple Watch, Apple is moving forward to integrate the technology across its portable device lineup. Along with this year's handsets, wireless charging will make its way to other products like AirPods. In addition Apple is slated to market its own charging pad called AirPower, which can power up to three wireless devices at the same time. 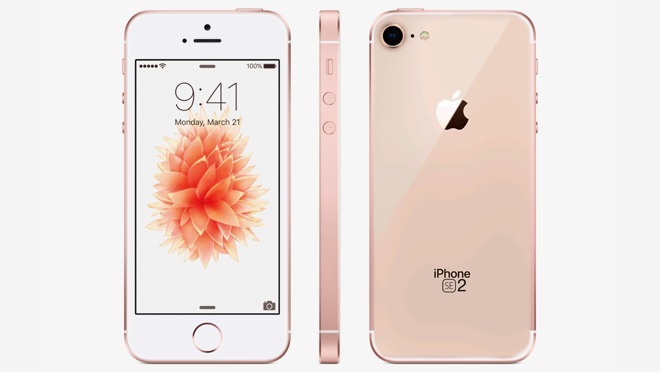 The so-called "iPhone SE 2" could end up looking very similar to the glass-sandwiched iPhone 4 series, and ship in the first half of next year. An Indian site, Tekz24, recently claimed that the new SE will have the iPhone 7's A10 Fusion processor and 12-megapixel rear camera, along with 2 gigabytes of RAM and a 5-megapixel front camera. The display may come in between 4 and 4.2 inches, with anything bigger than that being a significant change and an alteration of the form-factor. Tekz24's reputation isn't established however, and a separate rumor hinted that Apple could axe the SE line altogether. In November, China's Economic Daily News said Apple was moving ahead with plans to manufacture an iPhone SE 2 after the original version saw success as a small-format, low-cost alternative to the larger iPhone 6 and 7 series. While more expensive than many Android smartphones, the 4-inch SE is still Apple's cheapest iPhone, starting at $349. Thanks to a premium build and relatively low out-the-door cost, the iPhone SE has helped Apple gain marketshare in up-and-coming regions like India. To gain a foothold in the populous country, and comply with local sourcing laws, Apple has tasked manufacturing partner Wistron to produce SE units in India. Wistron is also rumored to be building the "SE 2." Over 75 percent of smartphones sold in India country cost less than $250, and the iPhone has a marginal share of the local market. It's expected that local manufacturing will help bring down the cost of iPhones in India, but whether buyers will take to the high-end platform remains to be seen. Apple has asked the Indian government for a number of exemptions following the start of production of iPhones within the country, and Indian officials signaled that they are considering the requests.